The present building is the third known church on this site. According to Shaw's "Staffordshire" an early 19th century topographical book, the first church was "very antient", consisting of a nave and two small side-ailles divided by round arches and large pillars ornamented at the capitals. It was replaced about 1800, in the prevailing neo-classical style by a "truly elegant specimen of Grecian architecture upon a small and simple scale, picturesquely situated upon a bold eminence... The inside is very neat and has a small organ suitable to its diminutive size". 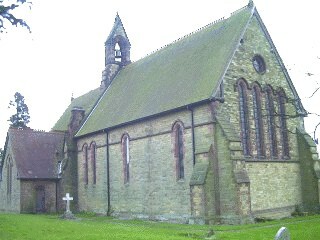 Within a century the church which Shaw had described as a "truly elegant specimen" was in a bad state of repair and it was decided in 1877 to replace it. The words of the author of "Staffordshire Towns and Villages", Lichfield 1899, show how taste had changed: for he described the "truly elegant specimen" as a"singularly plain structure". The present church was designed by John Oldrid Scott, the younger son of Sir George Gilbert Scott, one of the leaders of the Gothic Revival movement and one of the most successful Victorian architects. The cost of the building in 1883 was £5,000 and it was built at the expense of James Chadwick of Hints Hall, a cotton merchant and benefactor who also built and paid £4,000 for the vicarage (now Chadwick House) and endowing Hints as a separate parish from that of Weeford, of which it had hitherto been a part. Until 1948, when electricity was installed, the church was lit by gas and the cropped-off pipe of the gas supply can still be seen in the lane on the left hand side of the lych-gate.